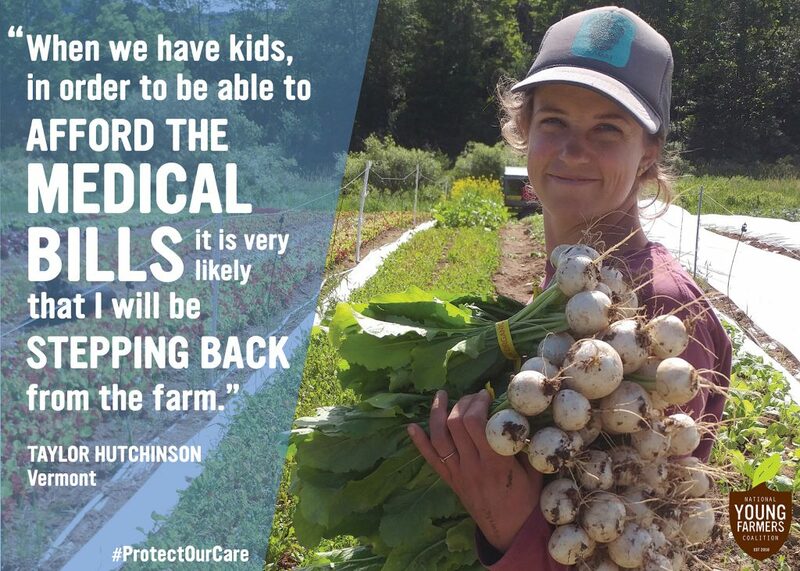 With the Senate’s repeal of the Affordable Care Act looming, young farmers from across the country are writing to tell us about what’s at stake on their farms. Here are their stories. If you have a health care story to share, let us know. 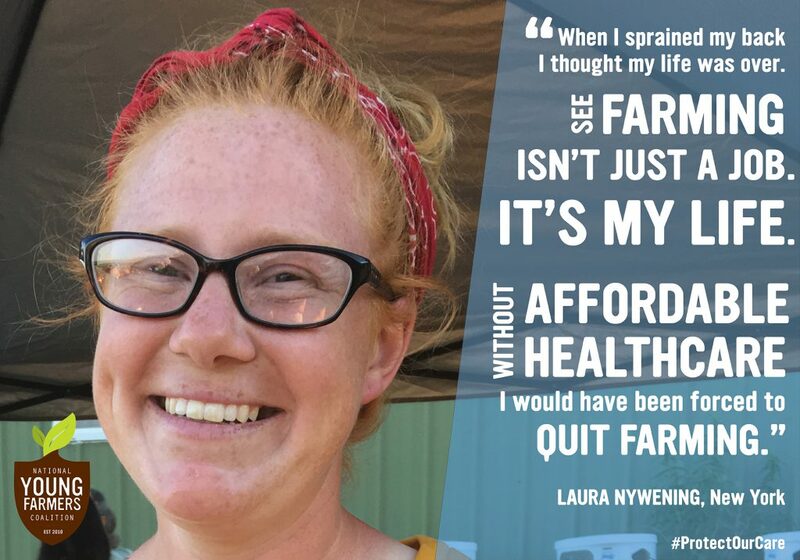 Help us amplify the voices of young farmers as Congress debates health care reform. My name is Bo Dennis, and I’m a young farmer in Maine. 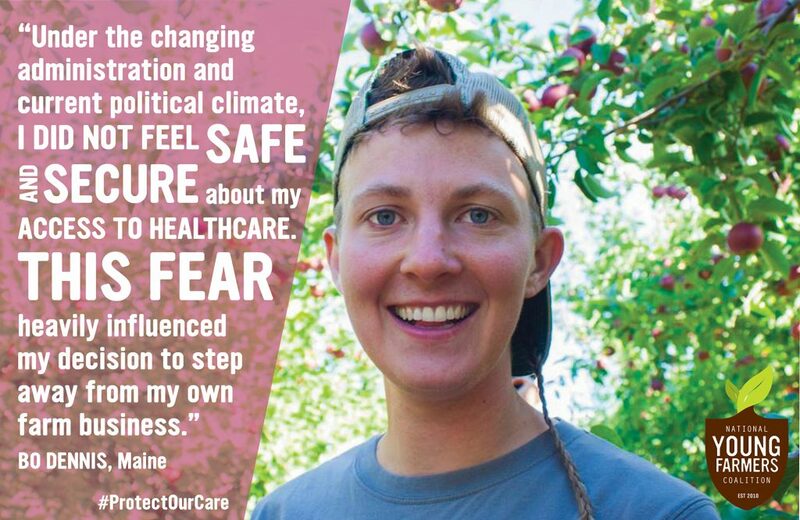 Health care is critical to me because I am trans, and I depend on daily medicine for my mental and physical health. Under the ACA, the medicine I need was almost completely covered. As a farmer running my own farm business, I was making around $11,000 a year. Health insurance was unaffordable to me without the ACA. We are farmers, but we are also people who often have other compounding health needs and issues. Our bodies are ever important in this work that is traditionally based around manual labor. Without access to affordable health care, I could not continue farming. Under the changing administration and current political climate, I did not feel safe and secure about my access to health care. This fear heavily influenced my decision to step away from my own farm business and take a farm manager job at a college. Access to affordable health care has affected my ability to farm, and what type of farming I can do. Senator Collins, I urge you to think of the health of all of your constituents and vote NO on the ACA repeal. My partner (business + life) and I both have health care through the Affordable Care Act. 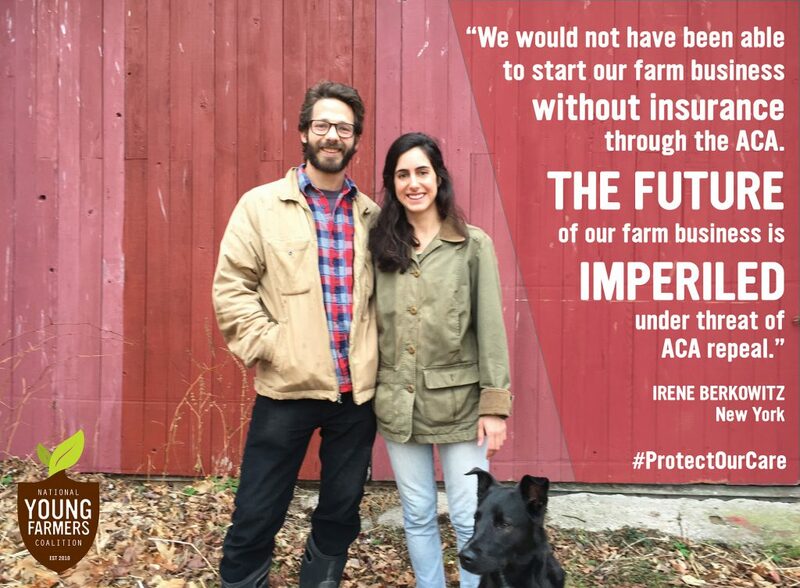 We would not have been able to start our farm business without insurance through the ACA, and the future of our farm business is imperiled under threat of ACA repeal. We’ve had access to quality health care through our rural hospital (also under threat through ACA repeal). I personally have received breast cancer screenings and monitoring, dental work, asthma testing and medication, and access to a general practitioner for routine exams and check-ups. Farming is physically demanding work, with a high risk of injury as compared to other professions. The thought of farming without access to affordable, quality health care is frightening. If the ACA were repealed by Congress we would have to seriously consider the future of our farm. It might require that one of us find employment off-farm for the sake of insurance coverage. This would undoubtedly shrink our farm’s prospects for the future. A major chunk of our farm budget this year is going toward paying off medical debt from an accident I had on the farm. That care would have been covered had our state expanded Medicaid under the ACA. Something that I think about is when we have kids, in order to be able to afford the medical bills for that, as well as daycare, it is very likely that I will be stepping back from the farm. The Affordable Care Act made it possible for Katie and Hans to live their passion without having to worry about injury. Unfortunately, they did not meet the threshold of qualification for income last year, and had to apply for Medicaid instead. The coverage is not nearly as vast or accessible as that of ObamaCare. If the Senate approves these proposed changes, Katie’s health care situation will go from bad to worse. While struggling to meet the income level to buy ObamaCare, she will now have to consider the idea that Medicare may not even be available if she does not. Katie is concerned that the disarray in Illinois will make decisions at the state level difficult and challenge her profession further. She questions why she keeps farming but she knows that passion drives people and she is not willing to give up on what she loves. Having obtained health care coverage through the ACA I now have the ability to maintain my health and focus on providing food to the local community. Agriculture is a start-up endeavor that does not typically afford people the ability to purchase health care on the free market. I hope that congress would not repeal the ACA, and instead, continue to improve the existing programs that are allowing more young farmers to enter into a career of food production. I haven’t had health care since moving to Wisconsin. In Minnesota I was able to access MinnesotaCare, but in Wisconsin the regulations are different. I can’t imagine being put out of work by having an on-farm accident such as breaking a bone, or some sort of infection from a cut. With as little money as I currently make it is simply outrageous that I can’t be on BadgerCare—I was told my income was too high by a few dollars. So far, my husband and I have been blessed not to have any injuries, but in the case that we do it is highly likely that we wouldn’t be able to afford the medical bills. I don’t think the general public understands the cost of running a farm, and how as a new farmer, running a farm can run you into the ground. So when you’re already exhausted and possibly have a broken bone—or a run-down mind—isn’t it ridiculous to think that there is no assistance for a farmer? No way for me to see an qualified mental health professional or a doctor of any kind without worrying about the cost? Someone who is growing great food to help feed their community and promote health and well-being! It really just gets my goat, and makes me want to move back to Minnesota! I’m really tired of worrying about the cost of out-of-pocket health care and trying to decide between a career I feel passionate about or copping out and working a regular 9-5 so I can have benefits. I want to live in a nation where I don’t have to choose, a nation that realizes small farmers make rural places great because we invest in our communities, a nation that realizes farmers are important in so many ways. As a young, beginning farmer, I don’t make a lot of money. To be frank: I make next to nothing. I know a lot of people who have based their careers choices on what jobs pay the most, have the best benefits, or have the most perceived esteem, and if I’m being honest: there are some days when an office job with a high salary is very appealing. There are times when I feel a physical, gut-wrenching longing for financial security. So then, why farm? Why not just go to the city and find a high paying job in an office, managing something? The short answer is, I am meant to do this. I am meant to wake up in the morning on the land that my ancestors farmed and grow food for my community. I am meant to do what I can to preserve this little patch of bucolic landscape in an ever widening sea of condos and strip malls and teach people about the history of agriculture in my county. I am meant to do what I can to shrink the positive correlation between healthy food and income. I can keep farming for little money because I find no greater joy than in seeing the expression on my customers’ faces as they bite into the first tomato of the season, or even better, the first fresh heirloom tomato they’ve ever had! I love the work, the sweat, the effort, the striving, the rewards and yes, even the challenges, though I might not agree with that last one while the tractor is broken down and the goats have escaped again. So, last year, when I sprained my back while working, I thought my life was over. See, farming isn’t just a job. It’s a lifestyle. It’s my life, as it has been for my family for five generations. Without affordable health care, I would have been forced to quit farming. Forced to find a job that offered insurance. Instead, thanks to the ACA, I could go to a doctor, who referred me to a physical therapist. We worked to fix my back over the course of six weeks and I’m happy to say, it feels great now. The ACA saved my farm and has helped me preserve this little slice of agri-heaven in the Hudson Valley! My name is Christi Hansen and I’m a vegetable farmer in Georgia. My partner and I started our farm on 1½ acres of land leased from a small family-owned goat dairy south of Atlanta a year and 8 months ago. Both of us had worked many years on other farms, but this was our first crack at managing our own operation, starting a business, and eventually creating 3 paid positions for other young farmers. Like many other entrepreneurs, we did not have a lot of capital, especially in the beginning when we were working full time to get crops in the ground but had nothing yet to sell. Because of the premium tax credit, we were able to buy health insurance for the first time despite being in the initial and very low income stage of starting our farm. I don’t know if you or your family has a background in agriculture, but it’s tough work. Even when the weather is perfect, a typically day is filled with potential injuries from tools, insect bites, and awkward positions hunched over rows of beans or shoveling compost. In short, plenty of potential opportunities that would necessitate medical attention. Not to mention chronic back pain (which is incidentally one of the leading medical conditions for which people are prescribed opioid painkillers). A serious injury could result in temporary or permanent disability that would immediately cost us our livelihood. It’s risky work and we do it because we believe our community needs to eat fresh, nutritious food. In addition to being a farmer, I’m also a registered dietitian in a hospital. I see what happens when people who don’t have insurance coverage to go see a doctor or specialist in a clinic end up in the emergency room with an exacerbation of a preventable problem like diabetes. They take up the space of someone who may be in need of urgent care from of an accident because the diabetic patient stubbed their toe and now they need a leg amputation because their uncontrolled blood sugar turned their foot gangrenous over time because the wound went untreated. Someone who can’t afford their prescribed congestive heart failure medicine can spend days in the hospital with almost a gallon of retained water around their ankles and lungs because they couldn’t afford their daily medication that prevents swelling. I also see so many patients with chronic diseases that are DIRECTLY related to not eating enough vegetables. People without insurance don’t get sick less, they get sick more because they can’t take proper care of their health. The average cost of a day at the hospital in Georgia is $1,400. Is this a better way to spend money than by preventing the visit in the first place? Plus people miss work and go into debt—neither of which is good for our state economy. As a farmer, the ACA helped us start our farm and feed our community without having to decide between additional debt and personal safety. As a health care worker, I’ve seen the ACA be overly complicated, but also keep people out of the hospital ER. If you want to change / fix it, I’m in full support. But please, consult with the social workers and case managers at some Georgia hospitals as you contemplate the changes. They work every day reconciling what different insurance companies will pay for with the treatment plan a physician knows is best for our state citizens. Do you have a health care story to share? Let us know. Help us amplify the voices of young farmers as Congress debates health care reform.